4-Panel – Large bag with 4-panels sewn together like a box. U-Panel – Large U-shaped bag with 2 side panels sewn to each of the opposite sides. Tubular – Circular design eliminates side seams, thus improved stability, sifting, and moisture resistance. Baffle – Typically a 4-Panel or U-Panel construction with internal fabric baffles to make the bag square. UN Certified – Designed to store and transport hazardous materials. ABC Polymer Bulk Bags are certified for Packing Groups II & III. Ventilated – Manufactured from woven polypropylene to allow airflow. BRC/AIB – FDA Food Grade: free of contaminants. ABC Polymer Bulk Bags BRC/AIB Certified. Color Options – Yellow, green, white, black, blue, red (a minimum order quantity is required). Uncoated – Standard polypropylene fabric. Coated – Fabric that is laminated with polypropylene film. Conductive – Fabric that conducts electrostatic charges. Ventilated – Fabric that is breathable. Type C Groundable – Designed to control for electrostatic charges by grounding. The fabric is woven with interconnected conductive carbon tape and ground tabs. Type D Dissipative – Designed with static protective fabric that does not require grounding. Delivers safety levels equal to that of Type C without grounding. Non-woven Polypropylene – Fabric from bonded fibers. Standard Loose Tube – Liner loosely inserted into the bag to fit any bottom or discharge spout. Form Fit – Liner fitted to the design of the bag to maximize container and liner capacity. Baffle – Liner added to baffles to stabilize the bag during filling. Groundable – Conductive polyethylene liner. Polyethylene Liner – Standard liner material used to control for moisture contamination (thickness ranges from 2-5 mm). Woven Polypropylene – Also known as a bag-n-bag, provides added strength and puncture resistance for heavy or sharp products. Non-woven Polypropylene – Liner allowing liquid to filter out. Sewn – Liner applied and sewn into the seams. Glued – Method of adhering the liner to the bag. Open Top – Economical for in-plant use, but not optimal for packaging. Duffle Top – Top opens out of the bag for easy filling. Inlet Spout – Top wraps around the filling spout for easy filling and spill-free shipping. 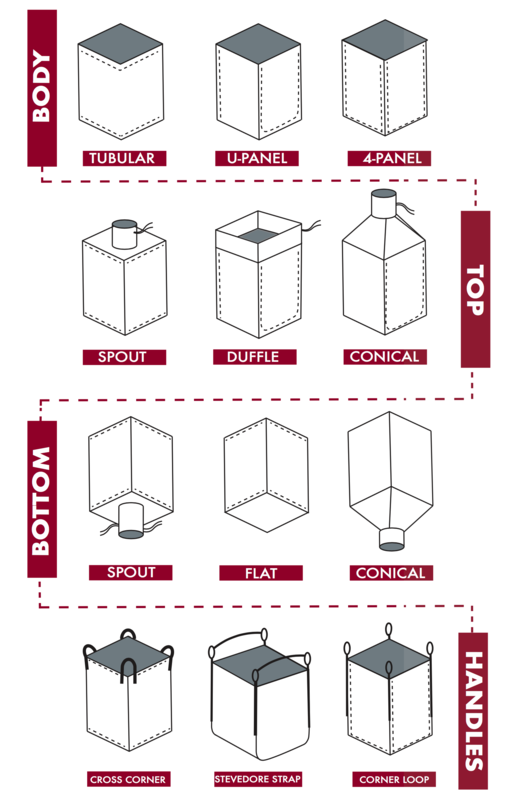 Conical Top – Allows for optimal filling space for products that need time to settle. Flat Bottom – Standard polypropylene fabric bottom with no discharge capability. Discharge Spout – Allows the bag to discharge from bottom in a smaller capacity. Full Bottom Discharge – Allows for the entire content to be discharged in one motion. Conical Bottom – Designed to help discharge flow. Closures – Tie closure, Velcro closure, diaper closure, star closure, drawstring closure. Side Seam – 4 loops sewn directly into the side seam. Corner – 4 loops sewn on the top of each corner for easy forklift access. Cross Corner – 4 loops sewn across corners for easy forklift access. Stevedore Straps – 4 loops sewn directly into the side seams with 2 straps connecting side loops for single point lifting. Single Loop – 1 large loop connecting two opposite sides for easy crane access. Sleeves – 2 sleeves sewn on opposite sides of the top for easy forklift access. Single Filler Cord – A single rope used to prevent product sifting. Double Filler Cord – A double rope used to prevent product sifting. Triple Filler Cord – A triple rope used to prevent product sifting. Perimeter Belt or Band – Bias tape/strap sewn around the top seam as a reinforcement or identifying mark – also known as Safety Belt. Double Reinforced Loops – An additional layer of webbing sewn throughout the lift loops for abrasion protection. Lift Loop Wear Pads – An added layer of protection against wear and tear of lift loops. Fully Belted Bags – Lift loop webbing sewn down both sides and across the bottom panels of the bag. Inlet Spout – Closure that covers the top spout to avoid leakage contamination. Sift Proof Seams – Seams that offer tight closure against products that are very small to guard against the product contents sifting out of the bag. Velcro Ties – Used for bags that need quick and frequent opening and closing capabilities. Document Pouch – Typically made of either polyethylene or polypropylene, it is where shipping or identifying documents are usually placed – also called a Pocket or Envelope. 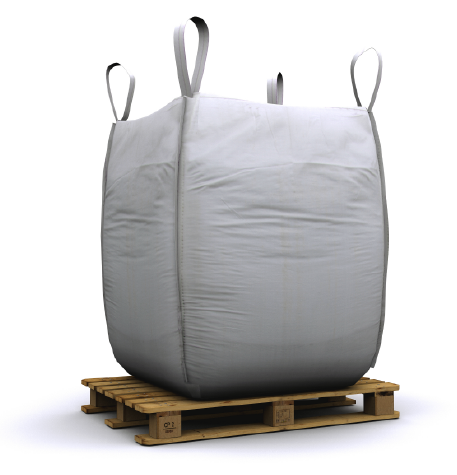 UN/DOT Certified – UN and DOT Certified bags for transporting hazardous materials. AIB and BRC Certified Food Grade – Certifies the manufacturing facility meets requirements set by the American Institute of Baking and British Retail Consortium for food products. FDA Compliant Food Grade – Meets the standard requirements for bags with intent to transport food. ISO 22000:2005 Certified – Certifies the manufacturing facility adheres to a Food Safety Management System. ISO 9001:2008 Certified- Certifies the manufacturing facility adheres to a Quality Management System.